Few industrial enterprises left a more enduring imprint on the American West than Miller & Lux, a vast meatpacking conglomerate started by two San Francisco butchers in 1858. 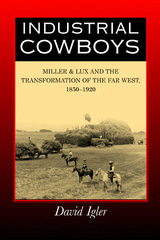 Industrial Cowboys examines how Henry Miller and Charles Lux, two German immigrants, consolidated the West's most extensive land and water rights, swayed legislatures and courts, monopolized western beef markets, and imposed their corporate will on California's natural environment. Told with clarity and originality, this story uses one fascinating case study to illuminate the industrial development and environmental transformation of the American West during the late nineteenth and early twentieth centuries. The process by which two neighborhood butchers turned themselves into landed industrialists depended to an extraordinary degree on the acquisition, manipulation, and exploitation of natural resources. David Igler examines the broader impact that industrialism--as exemplified by Miller & Lux--had on landscapes and waterscapes, and on human as well as plant and animal life in the West. He also provides a rich discussion of the social relations engineered by Miller & Lux, from the dispossession of Californio rancheros to the ethnic segmentation of the firm's massive labor force. The book also covers such topics as land acquisition and reclamation, water politics, San Francisco's unique business environment, and the city's relation to its surrounding hinterlands. Above all, Igler highlights essential issues that resonate for us today: who holds the right and who has the power to engineer the landscape for market production? David Igler is Assistant Professor of History at the University of California, Irvine.